Yes, You Still Have To Pay Income Tax In New England : It's All Politics Mississippi got lots of attention this week for finally having ratified the 13th Amendment, which abolished slavery. But many states have taken decades to join the rest of the country when it comes to amending the Constitution. And some have withheld approval to this day. 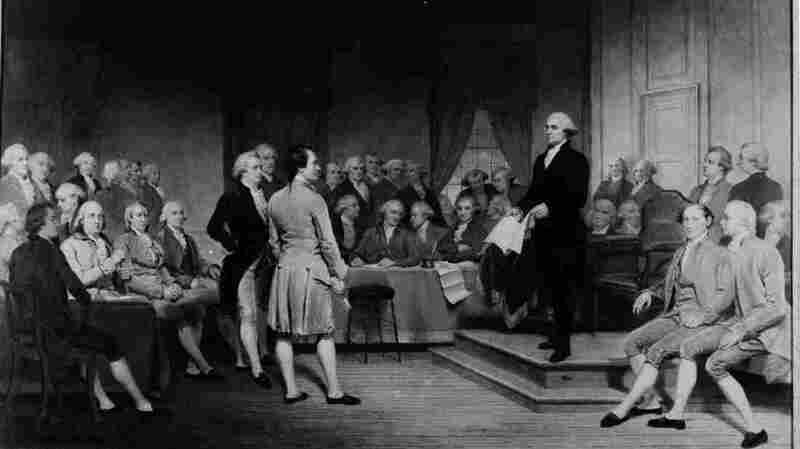 George Washington is depicted addressing the Constitutional Convention of 1787 in this painting by Junius Brutus Stearns. Presumably, no representative from Rhode Island is in the picture; Rhode Island boycotted the gathering and originally rejected the Constitution. Mississippi has received lots of attention this week for finally having ratified the 13th Amendment, which abolished slavery. But the state is hardly alone in being slow about blessing some long-established national principle. After a sufficient number of states have ratified an amendment, it can feel like a moot point for legislatures to give belated approval to laws that are already in effect. "Legislative calendars are crowded, and arguing over settled matters isn't a good use of time," says Larry Sabato, director of the University of Virginia Center for Politics. Remember from civics class how constitutional amendments are ratified? Two-thirds of both chambers of Congress approve a resolution, which is then sent to the states. If three-quarters of them pass the amendment within a set period of time, it's enshrined into the Constitution. This has happened on 27 of the 33 occasions that Congress has sent amendments out to the states. Of the six amendments submitted to the states that failed to attract the needed support, the most recent came in 1985, when time ran out for states to ratify an amendment giving full congressional representation to the District of Columbia. Once an amendment has been passed by three-quarters of the states, the others need not bother; it's settled law. Lots of states have withheld approval of amendments that have already achieved the support needed for ratification. For example, four states — Connecticut, Rhode Island, Vermont and Utah — have never ratified the 16th Amendment, allowing the imposition of the federal income tax. Their residents still pay up come April 15, though. "Massachusetts, Georgia and Connecticut didn't ratify the first 10 amendments until the late 1930s" — actually, 1939 — "about the time that the Bill of Rights became a big deal in the United States," says Pauline Maier, an MIT historian and author of Ratification. "They missed the boat in 1789-91." After the amendment to repeal Prohibition was rapidly passed by the necessary 36 states in 1933, only a couple of the states that had missed the boat ever bothered with it. "Maybe they felt they didn't need to, because other states had already repealed it," says Florence M. Jumonville, a historian and librarian at the University of New Orleans. But no state, it seems, has been as reluctant to sign off on constitutional provisions as Rhode Island. Some appear to be cases where the state's vote wasn't needed, such as the 16th Amendment and the 22nd Amendment (two-term limits for presidents). Rhode Island, though, had boycotted the Constitutional Convention and originally rejected the Constitution itself. It was the last of the 13 original colonies to approve the founding document, in part because of a long-forgotten argument over paper money. "They already felt they had just fought a war to get out from one distant government, and they didn't want to be under another one," says Al Klyberg, former director of the Rhode Island Historical Society. Rhode Island later pushed hard against the 17th Amendment, which created direct election of U.S. senators. Prior to its adoption in 1913, senators were chosen by state legislatures. The old system suited Rhode Island. Thanks to the clubby atmosphere it created in the Senate, Rhode Island Republican Nelson Aldrich so dominated the body that he was often referred to as the "general manager of the United States." Also, letting the Legislature pick senators ensured GOP dominance within the state. Rural towns dominated by the GOP had disproportionate representation in the state Legislature and hadn't selected a Democratic senator since 1850 (prior to the Republican Party's founding). "It was very clear why the General Assembly would fail to ratify that amendment," says Patrick T. Conley, historian laureate of the state. "It would be relinquishing power." Rhode Island also initially resisted the 15th Amendment, which (in theory, upon ratification in 1870) guaranteed voting rights for African-American men. One of its senators had already helped water down its language during congressional consideration, so that it didn't address discrimination based on nationality or ethnicity. Still, Rhode Island officials worried that it might interfere with the state's practice of requiring naturalized citizens to own property before they could vote. "There was a big anti-Irish sentiment to Rhode Island's reticence to amending," Conley says. Ultimately, pressure was put on the state because its approval was needed for ratification, due to opposition from Southern states as well as Oregon and California. Those states were reluctant to ratify for fear the franchise might be extended to citizens of Chinese ancestry; they didn't get around to ratifying the amendment until 1959 and 1962, respectively. A number of states have played catch-up in this way, approving amendments decades after they had become part of the Constitution. Tennessee, for example, didn't approve the 15th Amendment until 1997, while Maryland ratified the 17th Amendment just last year. "This is what you might call a feel-good ratification," says Richard Bernstein, the author of Amending America. "They're trying to make amends for having missed making it part of the Constitution the first time." But it's also a reminder that constitutional amendments — even though they must achieve some sort of consensus because of the supermajority vote requirements for passage — were often highly controversial in their day. There were reasons Rhode Island didn't want to approve direct election of senators, or Mississippi didn't vote to abolish slavery back in the 1860s. "Virtually all of the amendments were controversial in some way," says Bernstein, who teaches history and political science at City College of New York, "even the Bill of Rights itself."